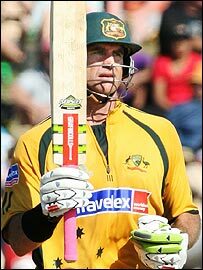 Matthew Hayden hit 181, the best score ever by an Australian in one-day internationals, but New Zealand won with three balls to spare. 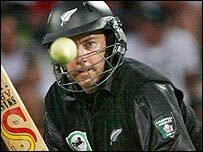 In an extraordinary day-nighter in Hamilton, the Kiwis were 41-4 needing 347 before a stand of 165 between Craig McMillan (117) and Brendon McCullum. McMillan reached his century off just 67 balls making it the fastest ever by a New Zealander in one-day cricket. And the result meant the Kiwis wrapped up the Chappell-Hadlee Trophy 3-0. Australia's defeat was their fifth in succession - and sixth in seven games - but for much of the match they were well on top. New Zealand lost the toss, were asked to field and were immediately chasing leather as Hayden put on 122 with fellow opener Shane Watson. The batsmen's life was, however, made considerably easier by New Zealand's decision to rest leading bowlers Shane Bond and Daniel Vettori. The eventual loss of Watson in the 26th over, lbw to Jeetan Patel, merely inspired Hayden to up the ante. He hit 11 fours and 10 sixes from the 166 balls he faced. Only Sanath Jayasuriya and Shahid Afridi (each hitting 11) have managed more sixes in a single innings and his total was just 13 runs short of Saeed Anwar's record 194. Hayden and Brad Haddin added a further 88 for the third wicket and the only bowler to escape a pasting was James Franklin (0-43). The remaining Aussie batsmen could afford to play brief cameo roles around Hayden's colossal innings. But the big Queenslander was hit on his right foot by a yorker and broke a bone in his big toe. He now joins Australia's growing injury list with the start of the World Cup barely three weeks away. Australia's bowling attack, without the rested Glenn McGrath, began well defending the excellent total established by Hayden. Shaun Tait removed the openers quickly and two further wickets left the hosts in deep trouble at 41-4. But the Kiwis effected a stunning recovery under McMillan. His century came up off just 67 balls, with the slow left-armers of debutant Adam Voges coming under the most severe attack. McMillan put on 75 with Peter Fulton (51 off 40 balls), before McCullum joined him into the closing overs. Finally, McMillan swung across the line to Watson and was bowled, departing for 117 off 96 balls. The wicket ended the massive stand which had lasted nearly 25 overs and looked like giving the Aussies a welcome victory. The tourists made further in-roads to remove James Franklin and Daryl Tuffey cheaply, but an unexpected 28 off 15 balls from Mark Gillespie got the required rate back to a run a ball. With seven wanted from the last over, bowled by Nathan Bracken, McCullum swung the first ball high over deep square leg for six. A dot ball followed, before the winning runs were secured with a sliced drive over the slips for four. New Zealand had produced the second highest successful run chase in one-day internationals, the leading four all coming against Australia in the past three years.